Elaichi & nutmeg powder for flavour. Cashew nuts & Almonds for decoration. Salt : 1 small pinch. 1. Take a big microwavable bowl . 2. Add 2 tsp desi ghee in the bowl. Microwave the bowl for 30 seconds. 3. Add Moong Dal powder & stir well. 4. Keep the bowl in microwave & roast the powder till it turns brownish & you can smell sweet aroma of ghee & moong dal powder. Stir the powder after every 1 minute. It will take about 3 minutes to roast. 5. Add remaining desi ghee, milk, sugar & stir well. 6. Keep the bowl in microwave oven for 4 minutes without covering. 7. Take the bowl out from microwave oven & stir the mixture properly. Keep the bowl again in microwave oven for 3 minutes without covering . 8. Add elaichi & nutmeg powder, stir & again keep the bowl covering in the microwave for 1 minute , stir & again repeat the process till moong dal cooks properly. It will take 2-3 minutes. Give standing time of 1 minute. This is very quick recipe otherwise it takes long time to roast the moong dal powder & it takes lot of ghee. 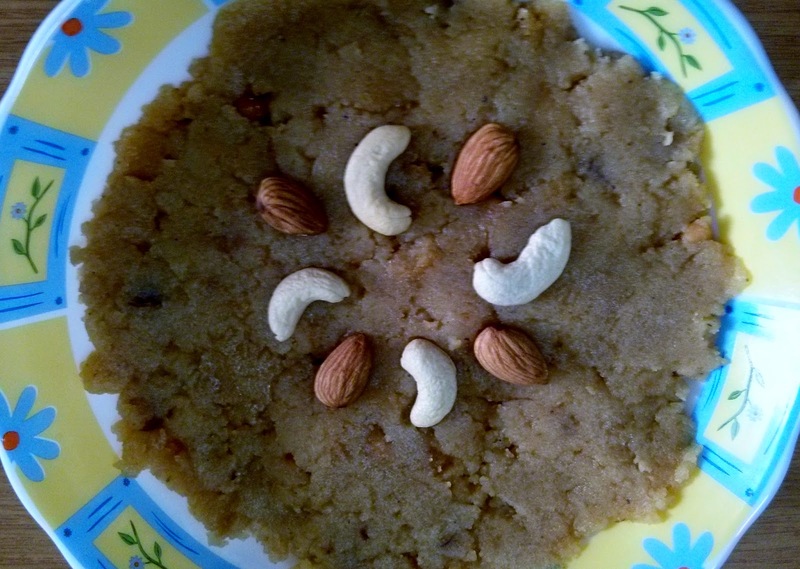 Decorate the yummy Moong dal halwa with cashew nuts & almonds & enjoy !! If you do not get coarse moong dal powder ( rava ) try this simple process. Soak 1 cup Moong dal for 4-5 hours. Then pour the dal in a sieve. Discard the water.Keep the dal in the microwave for 2 minutes. Let it cool completely. Grind the dal in the mixer & you can get coarse powder . Kothimbir Wadi in Microwave oven.